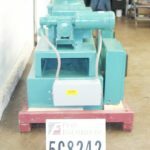 Feeder Weigh Auger machines use an auger or screw to feed a certain amount product. The number of rotations of the screw determines the amount of product that is fed. Designed for dry bulk product, powders, and slurries. Feeder weigh augers, which are also known as loss in weight feeder, uses a belt or auger to feed product. The amount of product fed is determined by weighing the amount of product that has been fed. Feeder weigh augers are designed for dry bulk product. Brabender, Model DDW-MS-FW120N/0, 12 ft³ hopper and auger loss in weight feed system. Capable of dispensing 397 ft³/hr – depending on materials, application, environment and machine configuration. 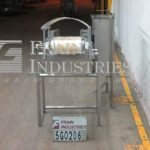 Equipped with 30" long x 24" wide x 30" deep product hopper with flex wall vinyle bottom with (2) external agitation paddles and 8½" OD product charge. 5" diameter x 28" long screw powered by a 1 hp drive with a pneumatic positive cut off valve. Mounted on MS base scale with 1433 lbs. (650 kg) load cells. AccuRate, Model Mechatron MODMCDG1A, stainless steel, auger, gravimetric feed system. Capable of dispensing 330 ft³ of product per hour – depending on materials, application, environment and machine configuration. Equipped with 28" OD x 12" Deep stainless steel 3.7 ft³ conical product hopper and auger gravimetric feed system. 1.2 ft³ vinyle bottom with (2) external agitation paddles. 3" diameter x 30" long screw powered by a 1 Hp drive. Control panel has touch pad controller with digital display screen, push button start, maunual / off / auto switch and variable speed dials for feed rate and agitation. Mounted on 330 lbs. (150 kg) load cells. WCB / APV / Anderson, automatic, stainless steel, weighing / feeding / blending system with gallons of product per hour – depending on materials and application. Equipped with 19" ID x 17" Deep 20 gallon, stainless steel ingredient hopper with (2) blade agitator, safety grid and see thru flip up molded plastic cover with shut-off, auger and blender tube with outlet, feed funnel has see-thru cover to rotor and scraper with enrobing case inlet. Control panel has controller with touch pad controls and start, stop, rotor, blender and agitator speed controls with auger and rotor speed indicators. Mounted on stainless steel base frame with caster. 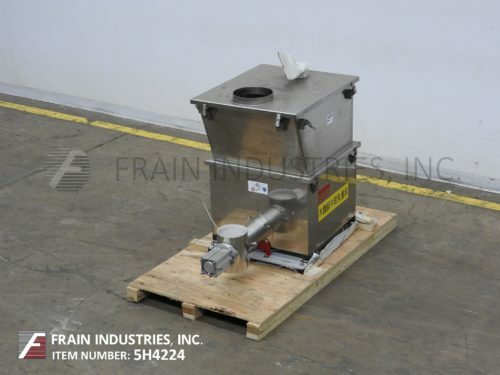 Designed to accurately / evenly meter ingredients into a viscous liquid product stream such as fruits / nuts (the ingredient), ice cream (the product) from a continous ice cream freezer and drop from the hopper into rotor enrobing chambers, deposits ingreidents to the product stream, blended and sent to filler. 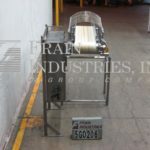 Industrial Process Automation, stainless steel, loss in weight, pivotal weigh belt feeder rated from 2500 to 10,000 lbs per hour – depending on materials & application. Weigh cell measurement: 16" in width x 40" in length. Max load capacity: 100 kg. Equipped with 56" infeed and 62"H Discharge. A/B Controls. Mounted on a stainless steel frame. Fully digital weigh scale / auger feeder system with a capacitie range of 120 to 136,000 lbs. per hour (based on 40 lbs per cu ft bulk density., and accuracies between +/- 0.25 – 1 percent. Has 10" dia top product feed opening with a 3" dia screw to feed to the bottom section feed chamber with a 4 1/2"dia screw has (2) MD II microprocessor controlers good for dust free wiegh scale auger applications.